Recently, we were contacted by a close relative who was concerned about aviation safety due to the possibility of a shortage of air traffic controllers. 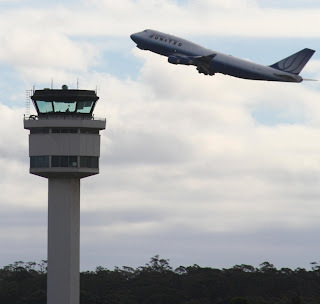 Never mind that most of the effects of the current budget impasse have been manufactured by the administration, it got us thinking that the public perception of the role air traffic controllers play in modern aviation has become somewhat skewed over time. Are they as essential to aviation safety as they once were? What role has technology played in the movement of air traffic? Let's investigate. While the history of the heavier than air craft dates back to the Wright brothers in 1903, air traffic control has its beginnings in the 1920s when people with flags would signal pilots when they could take off and land. What we consider modern air traffic control, with controllers actively directing the flight of aircraft, didn't occur until after World War II when radar became commonplace. The post war air traffic system that was developed consisted of aircraft following radio beacons across the country, and then being directed or "vectored" by a controller using radar to an instrument approach for landing. Tower controllers would control traffic in the immediate vicinity of an airport and control takeoffs and landings. It is important to note that while airplanes flew for decades without any need for ground control, air traffic control or ATC exists for two separate and sometimes conflicting reasons: safety and efficiency. In the infancy of aviation there was a theory that came to be known as the "Big Sky Theory" which posited that the sky was so big and airplanes were so small that collisions were unlikely. As aircraft grew larger and faster, it was soon determined that the sky was not so big after all. There are no fender benders in the air. Any collision would likely result in fatalities in one or both aircraft. Several high profile mid-air collisions such as the Cerritos DC-9 accident in 1986 crystallized the need for improved and error free aircraft separation standards. Concurrently, runways that were located near population centers became more valuable as air traffic increased. Construction of new airports in congested urban centers has become prohibitively expensive so the existing runways are needed to accommodate the greatest amount of traffic consistent with safe aircraft separation. At times the need for increased airspace utilization seemed to conflict with the need for the safest possible operation and all of this pressure was placed on the backs of air traffic controllers. Move traffic too inefficiently and the public complains about delays, but make one egregious error and people could be killed. Hence the popular depiction of an air traffic controller as a chain smoking coffee mainlining emotional wreck. But is this still the case? As in most every other aspect of human endeavor, technology has made huge advancements and changed the very nature of aviation as a result. Let's start with technology improvements in aircraft. The introduction of inertial navigation systems (INS) beginning in the 1970s and later GPS systems have largely eliminated the need for commercial aircraft to navigate by using ground based radio aids. While equipment on modern aircraft can still receive and use these radio signals, they are not necessary for extended range navigation and hence controllers are not as necessary to make sure aircraft stay on these imaginary "highways" in the sky. Most flight plans today are "point to point" with the aircraft able to navigate directly to a point hundreds or even thousands of miles away on a direct route. As a result of the Cerritos accident mentioned above, in-flight air traffic avoidance systems were developed and installed on all commercial aircraft. This system known as the traffic collision avoidance system or "TCAS", is an airborne data-link in which all participating aircraft with compatible equipment have a display in the cockpit showing the location and relative altitude of every other aircraft in the vicinity. The system not only detects possible threats, it can issue verbal and visual signals to the pilots in each aircraft to avoid a collision. All aircraft which wish to operate in the same airspace as commercial airliners must have some type of this equipment installed. This system has virtually eliminated the possibility of a mid-air collision. Lastly, an array of technologies have been installed on modern transport aircraft which fall under the general category of automation. On board flight navigation computers are now able to fly complex arrivals and departures with highly precise altitude, lateral positioning, and airspeed. Whereas before this technology was deployed, a controller might have to issue dozens of instructions to each individual aircraft, now a controller might issue one clearance for the entire procedure which the aircraft will then follow from initial descent all the way to the runway. Technology has also been improving the equipment that controllers themselves use albeit at a slower pace. Controllers now utilize predictive software tools which show where an aircraft will be at some future point based on current parameters. Flight clearances are now transmitted electronically to aircraft directly through a data link obviating the need for controllers to read them to pilots. The future of air traffic control technology will ultimately deconflict an aircraft from all potential collisions before it even takes off. Controllers today, like pilots, are becoming more system managers than hands-on operators. Artificial intelligence and other promising technologies will eventually mean fewer controllers will be needed to manage this system as it will only require human input by exception backed up by airborne systems and pilots. While air traffic control is a government function in the U.S., there is no innate reason for this to be so. A private corporation called Nav Canada handles all traffic control functions in Canada. There are other private corporations which provide ATC functions in other countries thereby avoiding the inevitable politicization and cost inefficiencies of a government bureaucracy with equal or better safety records. Commercial aviation is already one of the safest modes of transportation available and promises to become ever safer as new technologies are deployed. Were all radios to go dead today, rest assured that every airliner aloft would land safely. So the next time you hear of threats to air safety due to engineered budget crises, know that those threats are empty.